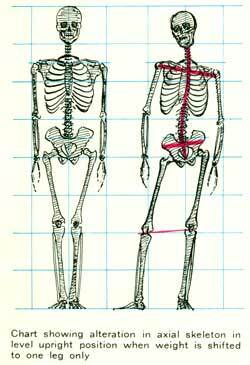 The skeleton determines the proportions of the human body, especially its length. The bones are for the most part joined flexibly to each other. From this fact arises the mobility of the body and the changes in its shape. The movement and position of the bones and joints are directed by muscles, which also affect the breadth of the body: a person with weak muscles is thinner than one with well-developed muscles. Muscles, too, determine to a large extent the contours and shape of the body. Skin and the fatty tissues under the skin level off these contours, rather as a firm chalk drawing is leveled off by stumping. The fatty tissues have sometimes more effect on the breadth of the body than the muscles. For instance, if someone fifty years old has a waist measurement half as much again as that of someone of twenty five, it is due to the increase of fat tissue; the skeletal measurements of both ages are practically the same. Bones are rigid and unalterable in shape. According to a person's constitution some parts of the bones can be seen more or less clearly modeled under the skin. These places are where the artist starts fixing the proportions of the body. The shape and function of the whole bone must be understood in order to understand the shape of the body where it comes to the surface. Bones also determine the posture of the body, which is evident when the functions of the bones and their relations to each other are known. The formal structure of a joint is unimportant for the artist; its function is what interests him. The simplest joints occur where two cartilaginous ends of bone meet without crossing and are held together with the fibrous cap which covers all joints. The most visible example is where the collar bone is attached to the breast bone. The cushioning discs between the vertebrae also allow a measure of movement to each bone against its neighbor. The spine as a whole is like a rod which can bend in every direction and twist around on itself. The ribs, with their cartilages and ligaments joining them to the breast bone and spine, build up the rib cage, which, thanks partly to the flexibility of the rib bones themselves, is a very elastic structure. The elbows and knee joints and finger and toe knuckles are like mechanical hinge joints, but, being organic structures, they are more elastic than rigid mechanical hinges. The knee joint as it bends also permits a twist to the lower leg down its long axis. The radius and ulna rotate against each other along the length of the forearm. The shoulder and hip joints are comparable to mechanical ball-and-socket joints. The shoulder can also rise and fall as a whole, and the entire shoulder girdle comprising collar bone and shoulder blade is attached to the chest in a way that allows some movement. The hands and feet are composed of manifold systems of hinge joints and articulations. As units they can rotate at wrist and ankle with the mobility of ball and socket joints. The movement of a large joint results in a series of movements in the smaller joints; for example, for you to stand on one leg, the pelvis must drop around the ball of the hip joint that is to take the weight, and the resting leg has to move away; the spine bends to find a stable equilibrium and thereby causes an asymmetrical movement of the ribs. Shoulder and arm joints also unconsciously adjust themselves more or less visibly to maintain a balance. This will naturally involve a corresponding reaction of the muscles.